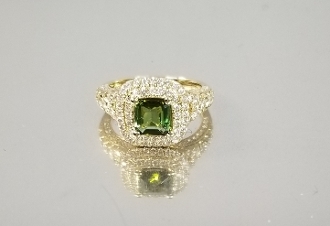 This solid 14 karat yellow gold ring has a beautiful Emerald cut Green Tourmaline set with white diamonds around the center stone. Total weight of the tourmaline is .93ct. Total diamond weight is 1.00ct. Copyright © 2012-2019 Kyle Chan Design. All rights reserved.